Oh Sylvie, this card is fabulous! I love the mixture of clean lines with the torn one and the balance you've created with the pops of green against the brown. So pretty! Thanks so much for joining us this week at the Paper Players! Sylvie this is lovely! The torn vellum is just gorgeous and I love your color combination! Thanks for joining us at The Paper Players! 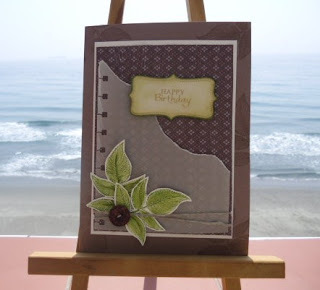 What a beautiful card, Sylvie! I love the torn vellum and your spiral punched edge. The cluster of leaves with the twine and button are the perfect touches. Thanks for playing with The Paper Players this week! Beuatiful card SYlvie....love the torn parchment across the card..
Sylvie, I love all the color and texture of this card! A great layout and those leaves are amazing. Thank you for playing with The Paper Players this week! Hi, I haven't popped in for a while, so I'm starting with no 1 and going to work up LOL. Stunning work, love the torn paper. Thanks for joining the Paper Players!